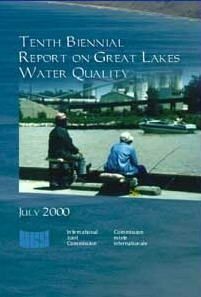 clearer, harsher wording be added to Great Lakes fish eating advisories. defects. The Great Lakes Radio Consortium’s Mike Simonson reports. many fish can lead to a lower IQ and behavioral problems in children. both countries signed two decades ago. Commission says the scientific evidence can no longer be ignored. For the Great Lakes Radio Consortium, I’m Lester Graham. The IJC is warning the U.S. and Canada to stop delaying the clean up of the Great Lakes. U.S. and Canadian governments to monitor the quality of the Great Lakes. compromised. In its last report two years ago… the IJC admonished the U.S.
the IJC could no longer ignore the scientific evidence. eat the fish know about the risks. states, but she says it can make some recommendations. Lengelle, says the commission is not ignoring it. ago, there can be little hope of fully restoring and protecting the lakes. For the Great Lakes Radio Consortium, I’m Lester Graham. have closed down or scaled back similar facilities. down all four of its remaining prison farms. pretty big challenges, as well. two-dollars-and-thirty-cents to feed each of its inmates. somewhat by operating farms to help feed the prisoners. studied that state’s prison farm system. appropriate training for inmates going back to urban areas. the state operates three prison farms. typically outside the secure perimeter of the prisons. close many prison farms in recent years. Still, some think the idea could be a hard sell. between the ears, you know, ‘not in my backyard’”. most escapees are captured without incident. statewide system of new farms. where inmates raise about forty-percent of what they eat. for other states to do the same. some of their own weight may be as old as prisons, themselves. farm – the prison farm, that is. found raising dairy cows, produce, pork, and more. Peninsula, sits the Marquette Branch Prison. Eight gun towers, manned twenty-four-hours a day. just got another new arrival. That’s because he’s not an inmate. operation, housed not far outside the prison fence. notable exception – all the workers are prisoners. They’re assigned jobs like feeder, milker and herdsman. But Tuimala says they all start out as barnsmen. …the guys who clean up after the cows. recorded interviews with inmates at the prison. provides jobs for about fifty minimum-security prisoners. feed each of the state’s forty-five thousand inmates. them could be significantly reduced. farms, and a few have done just that. that they can use on a farm, or in a factory. soon, the diary will begin making ice cream. even point with the cost of running the operation. all forty-two of the state’s prisons. biologist for Ohio’s division of wildlife. Pennsylvania, New York, and the Canadian province of Ontario. comprehensive review of progress toward cleaning up the lakes. the two nations. Frank Bevaqua is a spokesperson for the IJC. they’ve done that. It’ll be available at the commission’s website… at ijc.org. For the Great Lakes Radio Consortium, I’m Lester Graham. Lakes Radio Consortium’s Mary Losure reports. corn and half the soybean crops. possibility of genetically altered farm livestock is on the horizon. need so their blood can clot properly. genetically engineered to resist diseases or produce more milk. producing genetically engineered animals on a large scale. social and ethical questions raised by the new technology. modified livestock for widespread commercial use. farm animals. But transgenic FISH are much closer to the market place. sterilizing its genetically modified salmon. For the Great Lakes Radio Consortium, I’m Mary Losure. – between six and 14 inches long. Station on Oneida Lake in New York. have a large enough effect. many communities around the Great Lakes. – and in some cases, the local economy. were having such a large effect. on new research that may point to an answer. community, hoping to catch “the big one”. walleye are much tougher to find. exactly the size the cormorants like to eat. field station on Oneida Lake. causing the decline anglers were attributing to them. That’s when the fish are in the six to 14 inch range. the birds have eaten more than half of them. on Lake Erie and Lake Ontario. Johnson says this a new finding in cormorant research. On Lake Ontario, they’re killing eggs. the anglers argue it’s not enough. plight of many Great Lakes fishermen.